To get to Fiji is easy. There are regular flights to the Fiji Islands from a network of major airlines from anywhere on the globe connecting Fiji to the rest of the world. Besides a number of international airlines that fly to the islands, there is also Fiji Airways, Fiji’s own airline. Fiji Airways offers regular direct flights from Hong Kong, Tokio, Sydney, Auckland and Los Angeles to Nadi, as well as flights to many Pacific Island Nations. The number of flights to Fiji and the permanently changing prices can make it difficult to find the best flight deal. Using an independent flight search engine to compare flights and prices helps to find the cheapest ticket available. Jetradar is one of the largest online search engines to compare and find flights all over the world. One of the fastest flight search engines on the web, it searches over 1000 airline sites and travel sites simultaneously for airfares and special offers to help you to book the cheapest tickets available. The Fiji Islands location in the middle of the Pacific makes Fiji the Hub of the South Pacific. Nadi International Airport is located on the eastern side of Fiji’s main island of Viti Levu. Besides international flights to Fiji arriving here, Nadi Airport is also Fiji´s Domestic Airport gateway to most of the Islands of Fiji. Over 300 islands and 500 islets in the Pacific just south of the equator, those are the Fiji Islands. In the old days called Feejee, the Cannibal Islands. Today it is a modern Melanesian Island country inhabited by the friendliest people on Earth. 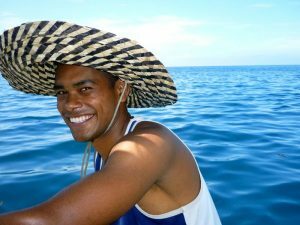 The Hospitality of the people of Fiji is legendary and for many visitors to the Islands the most memorable experience.